I know, it's a SHOCKER!!!!! Well, you must be shocked - two posts in three days. How unlike the Bean. She only posts once in a Millenium, it seems. And only about depressing stuff. Well, something so huge in the news has brought me out of my shell and feeling the need to blog up a storm. Is it about the war in Iraq, Bean? NOPE. Is it about famine in Africa that American Idol has so kindly brought to our attention? Sorry, it ain't. Okay, then it MUST be about the Va. Tech shootings. Wrong again and I already blogged about that - weren't you paying attention? I know, I know - it may not seem as important to some - but to those of us who are comic books and superhero GEEKS, like me, THIS . . . IS . . . HUGE. Because if kryptonite exists, whose to say that superheroes can't exist either? Yes, there are our everyday, everyman superheroes - but those aren't who I'm talking about. I'm talking about heroes with superpowers - is there a Superman? Wonder Woman? Flash Gordon? Captain America? I say there are. And now, because of what was found in Serbia, I'm one step closer to finding out who they are. And, in this day and age, and what has been going on lately in my life, I need to think that. So thanks to the scientist who located something for me to help with my belief and brighten my day. I just wish it had been green. Alec, what were you thinking? It broke my heart to hear Baldwin screaming at his daughter. Yes, the situation is frustrating. Yes, I totally get that you miss your daughter, especially in light of what is going on with us. But I DO NOT UNDERSTAND why you would take your frustration out on an 11 year old girl who is already stuck in between two feuding parents and already must feel every single pain that is going on between you and your ex. That is exactly what Mr. Bean and I are trying to avoid with our two girls. Yes, we are fighting for them (and losing profusely), but they will never know the awfulness that is going on except for the fact that we want them and love them. Never a bad word will be said to them about anyone else involved. It's not their fault - they are just stuck in a horrible situation. Just like your daughter Mr. Baldwin. And how dare you make her feel even worse about the situation than she already does. It's your role in life to ease her unhappiness, ease any pain she has, as best as you can. Not add to the issue. I hope you apologized to her. And not to make the media happy, or the courts happy. You need to apologize to her because she deserves it, and you were wrong. I'm not Ready to Back Down, I'm not Ready to Make Nice! Well, as I'm sure most of you have heard, and if not, go to SATURNdiary for the details, Social Services did their second evaluation which basically consisted of a couple of hours of crap with the girls and no discussions with any of the foster families who actually live with them now or the families who are willing to adopt, aka, Mr. Bean and I, and have decided it's in the best interest of the kids to stay together and their behaviors are just normal kids behaviors. Funny, considering the therapeutic foster mom who lives with our two girls now and has for several months and who has THIRTY YEARS EXPERIENCE says it's absolutely NOT normal and the psych who has worked with them for MONTHS and not two hours like this second evaluation also determined its NOT normal and that they need to be separated for their own well being. So, in this case, it's not in the best interest of the children - it's in the best interest of their funding. So, although I'm a basketcase, I'm still fighting this - even if it's just for my own sanity. Mr. Bean believes we should stop for the girls' sake, but I can't do that right now. I feel like I've lost my own - and I'm lost as well. This is the only way I can go on. But don't worry, I won't do anything that will hurt them - if it comes to that - I would obviously stop. There's a hearing tomorrow - I don't expect much to come of it, but one can only hope. So once again, I need good thoughts, prayers, karma, vibes or whatever you do. thanks and wish us luck. I grew up in a small town that I always found as a kid and teenager, boring as hell. I couldn't wait to get out because there was "nothing to do"; "no fun"; "no future" and "too small". As I grew older and moved away, from two hours away to 12 hours away, I came to miss this place of peace and safety. I always dreamed of moving back because I thought of it as a wonderful place to live and have a family. It was a place that I would not have to worry about myself or those I loved. A place where you could keep your doors unlocked and still sleep peacefully at night. I love this place; and if it wasn't for the nature of Mr. Bean's and my profession, would be a place I would move back to in a heartbeat. This place's peace and tranquility was shattered yesterday because of the hate of one person. I lived in Roanoke, Va. only approximately 30-40 minutes east of Va. Tech. And Blacksburg was even smaller - a cute, quiet and lovely college town. Another place to raise your family and not worry about the dangers of the outside world until April 16, 2007. Why did this have to happen? Why would someone, who intended to kill themselves, feel the need to take the lives of those who did nothing to him other than be in the wrong place at the wrong time? I am not an advocate of suicide. In fact, I am fully opposed to it and find those who do it to be weak and selfish who do not care for those who love them who will be tragically effected by the suicide. But, in this instance, if suicide was this man's endgame anyway, why couldn't he have just taken himself out without the needless death of all of the innocent victims? 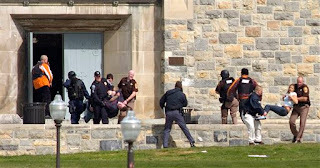 Blacksburg and Roanoke have just matured as a result of yesterday. And it makes me so very sad to see their innocence gone. My thoughts are to all of those effected by this senseless tragedy. This Goes Out to the Ones I Love . . . Yes, to my wonderful, sweet cyberfriends. And you know who you are - those I have talked to (great chat the other night PB, Bob and Tig, even though I was literally half asleep! ), written to, received comments from, etc. It has really lifted me up during a very tough time. Also, Tig and I have talked about this at length - I love New York. She picked the wimpy whiner and then he proposed! I about fell off my chair laughing at her shock! Now I can't wait for Flavor of Love Charm School. Speaking of VH1 shows, I can't wait for "Celebrity Fit Club" - there are a lot of good people on it this time - Screech (who I heard went nuts on the show - BIG TIME! ), Maureen McCormack from Brady Bunch, Kimberly Locke from American Idol, Tiffany, and more. I enjoyed watching it last time b/c I monitered my weight loss and compared it to them - and I did much better! Speaking of which, I have lost 103 pounds and have only 5 more to go! I'm getting new clothes, looking much better and am much happier in that area. I just wish I hadn't had to lose that much weight in the first place. But oh well, it's gone, I'm going to sell my old clothes and move on with my life in that area and not make food my stress reliever anymore. In fact, I now find that, when I'm stressed, I don't want to eat which is the exact opposite of what I used to be. Yeah me! So that's all for now folks and know I love ya! This is the WORST Easter EVER. Well, after all that happened, all Mr. Bean and I had to look forward to was having the girls this weekend. Well, Friday, about an hour and a half before we were to pick up the girls, we were told the "powers-that-be" changed their mind and we could only have the girls on Easter, not Friday to Sunday night as previously planned. The reasoning was by an administrator who knows nothing about kids and decided it would put the girls' hopes up. This is stupid for several reasons. First, the girls know nothing about the situation yet. Second, they will now think we don't want them for the weekend. Third, what's the difference b/w us seeing them Sunday or the whole weekend -if they were worried about that, we shouldn't see them at all. Fourth, the girls are never going to trust anyone at this point with the last minutes changes. We fought it and lost. But we were looking forward to Easter. We made easter baskets, set up an easter egg hunt, were going to color eggs and go out to Easter brunch in their brand new dresses I let them pick out last week. Then, I get a call last night from their foster mom at about 7 p.m. They both have a viral infection and are pretty sick. So they can't come. So we were downsized from a whole weekend to one call to wish them a Happy Easter.